Baker-rific! : If you have a weak stomache, don't read this! This weekend was interesting. Saturday, as I was doing laundry, and getting some corndogs cooked for the boys for lunch, I heard a wail coming from the living room. The boys had been playing with the wood by the fireplace all day, stacking it and "making houses." As I turn the corner from the laundry, I see Brensyn, standing in the bin that usually holds the wood, head up trying to cry, but can't cause he's out of breath. As I look at him, I see a dark mark on his forhead, and knew right away it was a gash that was about to start gushing blood. I ran over to get him, and when I got there, the blood started running down. I grabbed a tissue and held it on there, as I ran, with him in my arms, to get some gauze from my bathroom cupboards. He's wailing the whole time, not wanting me to push on it, but I'm trying to stop the bleeding. 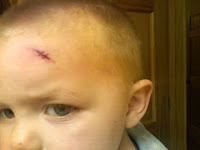 So now, I'm holding him while on my bed, pushing on his "owie" and trying to figure out what to do next. I knew it needed stitches because as I pulled the tissue away to apply the gauze, I noticed some of the "fat" was coming out. So I called my neighbor, Lori, and explained that I needed to take Brensyn to get stitches, and could she come over and help me really fast. She made it over in record time, and I hear the door come open, and running steps to get to my room. She held the gauze in place while I put Ansleigh in her carseat, and got shoes and socks for the boys. I had to try and find a way to keep the blood from getting all over the car, so I found a big bandaid, that goes all the way around the wound, and held the blood in quite nicely. I gave him a sucker, which stopped the wailing instantly, and got on the road. Lori kept Kies for me, so it was just Brensyn, Ansleigh and I on the road to Bozeman. Yes, all the way to Bozeman with a bleeding baby! Jaran met us at the ER and took Ansleigh for a while so we could check in. So they gave him some medication that was supposed to put him to sleep- and it didn't... but it did calm him down enough so he'd sit still. Then they put some numbing liquid on a cottong ball and taped it to his head. 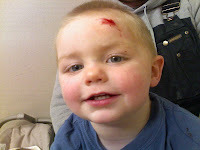 After about an hour and a half- two hours of waiting, he got stitched up, and we left. That's when the fun really started. Whatever drug they had given him to help him fall asleep, which he never did, made him go crazy. We had to go to Walmart to get some Neosporin for his head, and he kept flipping out crying and trying to bail out of the cart... so I had to put Ansleigh in the shopping cart part and put him in the seat and strap him in. He cried most of the way home and finally went to sleep when we got off the interstate. Then we stopped to get Kies and went home. He woke up and cried himself back to sleep. Let me clarify- not so much crying and yelling/screaming/crying. It was great fun. I don't recommend it to many people. But we're all good now! Here is a before and after shot! Oh my heck! how scary!! I'm sure my runs to the ER are ahead of me. That must have been some pretty sharp wood he was playing with. Stetson took his first step today! !